When it comes to making tech products take off, some companies are learning the secret: Use the Force. Littlebits, which makes educational products that teach kids the basics of electronics, is the latest tech company to link up with the Star Wars franchise. The company on Thursday introduced a $99 kit that lets people build their own working R2-D2. The debut came alongside a number of other new Star Wars products, including several drones and an augmented reality light saber and headset from Lenovo. Littlebits is following the path taken by Sphero. That startup began as the maker of a quirky smartphone-controlled ball, but really saw its fortunes take off when it struck a deal to turn its ball into a BB-8 droid. Sphero also announced new Star Wars models Thursday, including its own take on R2-D2 as well as the latest Star Wars droid: the BB-9E. The bottom line: Bringing tech products into the Star Wars world makes them instantly more appealing and compelling to a large segment of kids and adults alike. Works both ways: While Star Wars branding is a huge boost to tech products, it also gives Disney a new category to grow its revenue and make that gigantic Lucasfilm purchase pay off. As for Littlebits, the Star Wars opportunity came about after it took part in a Disney Accelerator program last summer. Bdeir said she consulted with Sphero CEO Paul Berberian, a friend, before inking the Star Wars deal. His advice, she said, was "Be sure when you go to Disney you are ready to take advantage," she said. "It's a behemoth." 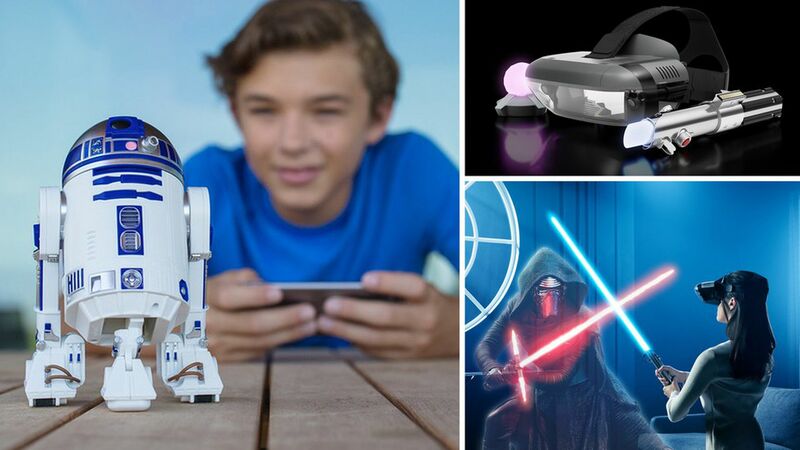 Here are some more details on the Star Wars tech products that were announced Thursday. Star Wars: Jedi Challenges Augmented Reality Experience from Lenovo: Works with iPhone and Android, comes with a headset, lightsaber and tracking beacon, available this holiday season, with pre-orders from BestBuy.com and Lenovo's Web site. Propel Star Wars Battle Drones ($179 each): Coming later this fall. Models include T64 X Wing Starfighter, Tie Advanced X1 and the 74Z Speeder Bike quadcopter. Littlebits' Droid Inventor Kit ($99): Available now from Walmart, Amazon, Apple Store, Disney Store and littleBits.com.